Whole home sound systems allow you access to all your music, regardless of the source: owned, streaming, satellite, radio, or recorded. Imagine the ease of control you will feel managing your home’s audio system from your iPhone, tablet, or a central location! 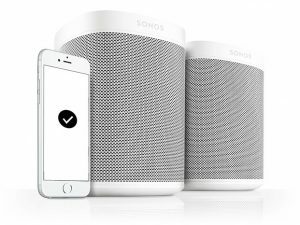 Using the latest technology such as Sonos OneTM with Amazon AlexaTM, Smooth Automation enables you to control the sound for each section of your home from various of devices of your choice — including song selection, source selection, and volume. There are huge variety of audio options, but Smooth Automation partners with world-class manufacturers like CrestronTM and SonosTM to deliver you the absolute ULTIMATE in listening pleasure! Allow us the chance to open the huge window of choices in audio distribution system designs that are available to you and then work with you to design and implement the perfect, customized system that meets AND exceeds yours and your family’s unique requirements. Click here for more information or call us now at 936-224-7199 to learn how Smooth can change your world. You will be amazed by our team members’ consultative approach and friendliness combined with a laser focus on solutions that are built around your individual needs and preferences!